Factors such as rapid globalization, the increasing demand for advanced valves in the marine sector, and a sizeable rise in foreign trade have acted in favor of the marine actuators and valves market’s expansion worldwide. While the market is projected to report a CAGR between 5.9% between 2016 and 2025, it is in developing nations that it will witness maximum opportunities. In 2016, the market’s valuation was at US$2.64 bn. However, rising at the aforementioned CAGR it is forecast to reach US$4.43 bn by the end of forecast period. In response to the rising international trade, the demand for marine transport is surging. This has subsequently tipped scales in favor of advancements in marine actuators and valves market. With the recent technological improvements, the marine industry now uses advance actuators and valves, thus providing wide scope for the market. The global marine actuators and valves market can be bifurcated into actuators and valves. Of these, valves accounted for the leading market share, however, during the forecast period the actuator segment is forecast to exhibit a higher CAGR of 6.4%. Pneumatic actuators, hydraulic actuators, manual actuators, electric actuators, mechanical actuators, and hybrid actuators are the most common types available in the market. Some of the commonly used valve types include linear motion valves, rotary motion valves, specialty valves, and self-actuated valves. The linear motion valves segment is further bifurcated into globe valve, gate valve, diaphragm valve and pinch valve. The rotary valve is segmented into ball valve, butterfly valve and eccentric plug valve. Of these, the rotary valve segment has witnessed considerably rising demand in the last few years, followed by ball valve. Based on vessel type, the global actuators and valves market can be segmented into passenger ships and ferries, dry cargo vessels, tankers, dry bulk carriers, special purpose vessels, service vessels, fishing vessels, off-shore vessels, yachts, and others. Of these, the use of actuators and valves is the most common in ferries and ships. The predominant use of butterfly valves and ball valves is noticed in these vessels. Among actuator types, hydraulic actuators make the ones most commonly used in ships and ferries. Regionally, Asia Pacific, Europe, North America, South America, and the Middle East and Africa constitute the key segments in the global marine actuators and valves market. Among these regions, Asia Pacific held the lead in the overall market. Its dominance is expected to remain unaffected through the forecast period. The Asia Pacific marine actuators and valves market is therefore expected to hold 44.4% of the overall market by the end of 2024. Economic growth witnessed in major emerging economies, besides China’s transition from manufacturer of low technology valves to a producer of myriad high-performing technology products has been of great support to the Asia Pacific marine actuators and valves market. The development witnessed in the regional market is also spurred by the growth witnessed in the Chinese nuclear industry. North America has emerged as the second leading market for marine actuators and valves. Growth witnessed in the region is augmented by its existing sophisticated industrial infrastructure. The global marine actuators and valves market comprises both large and mid-scale companies. Some of the most prominent members in the market are AVK Holding A/S, Bürkert Fluid Control Systems, Emerson Electric Co and Flowserve Corporation. These companies have a strong global presence and are currently focusing on providing more advanced solutions to cater to the requirements of the marine industry. Some of the other prominent companies operating in the global marine actuators and valves market are KITZ Corporation, Rotork Plc, Schlumberger Limited, Tyco International Ltd., and Watts Water Technologies, Inc. This report provides an analysis of the global actuators and valves market for the period from 2015 to 2025, wherein the period from 2017 to 2025 comprises the forecast period and 2016 is the base year. Data for 2015 is provided as historical information. The report covers all the major trends and technologies playing a major role in the growth of the actuators and valves market over the forecast period. It also highlights various drivers, restraints, and opportunities expected to influence the market’s growth during this period. The study provides a holistic perspective on the market’s growth in terms of revenue (in US$ Bn) and shipment (in Mn Units), across different geographical regions namely North America, Europe, Asia Pacific, Middle East & Africa and South America. Actuators and valves has significant importance in marine sector. A variety of valves are used in piping and machinery system of a ship as per the requirement of the flow pattern of the liquid. All valves used in ships, ferries and yacht have the basic functionality of regulating the flow of liquid in pipe. Among valves, gate valve is the most commonly used valve type in marine sector. Since it is convenient in terms of functionality and design, its applicability is wide .The actuators are mechanical device that are used to convert energy into motion. Actuator play a crucial role in marine industry. Largely used in boats and yachts, actuators are used for automation in marine machine. Pneumatic and electric actuators are the most common type of actuators used in marine industry. 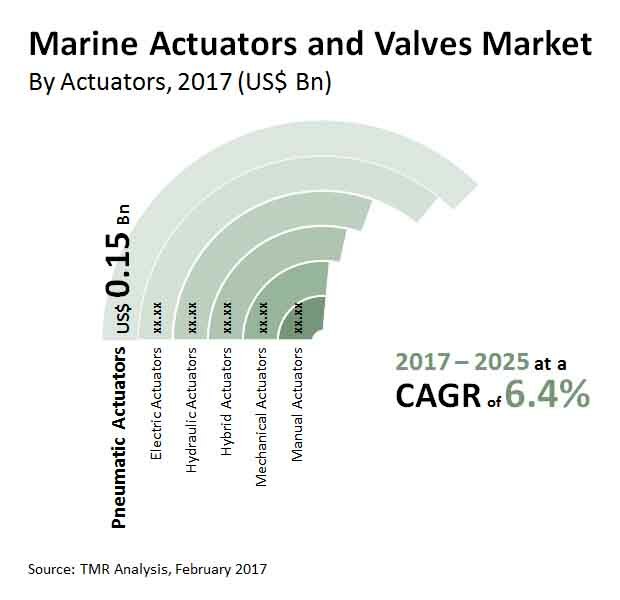 The global marine valves and actuators market is driven by growing demand for more advance actuators and valves in marine industry as well as rapid globalization that has increased the number of ships and other vessels for frequent trade and cultural exchange. Moreover, growing demand for innovation in actuators has also given a major push to the market. However, slowdown in research and development in the market is expected to restrict its growth. Nevertheless, manufacturers operating in this market need to modernize as well as simplify actuators and valves in order to push the market forward. Moreover, there is increased demand for energy efficient system that is expected to eliminate the concerned restraints, helping the total market to achieve positive growth. The market overview section of the report showcases the market dynamics and trends such as the drivers, restraints, and opportunities that influence the current nature and future status of this market. The report also provides the value chain analysis and porters five force model for the marine actuators and valves market. The marine actuators and valves market data estimates are the result of our in-depth secondary research, primary interviews and in-house expert panel reviews. These market estimates have been analyzed by taking into account the impact of different political, social, economic, technological, and legal factors along with the current market dynamics affecting the market growth. The reports includes global marine actuators and valves market bifurcated on the basis of type and vessel type. By type, the global marine actuators and valves market is categorized into valves and actuators. The valves have four types including linear motion valve, rotary motion valve, specialty valves, and self-actuated valve. And actuators include pneumatic actuators, hydraulic actuators, manual actuators, electric actuators, mechanical actuators and hybrid actuators. Further, the vessel type segmentation includes passenger ships and ferries, dry cargo vessels, tankers, dry bulk carriers, special purpose vessels, service vessels, fishing vessels, off-shore vessels, yachts and others. The report covers the analysis of these segments across all geographies, along with qualitative analysis for key market indicators supplementing the growth of marine actuators and valves market during the forecast period. The report also includes competitive profiling of the key players associated with the actuators and valves market around the globe. The important business strategies adopted by them, their market positioning, financials, SWOT analysis, and recent developments have also been identified in the research report. The competitive landscape section of the report also gives an overview about the major contributing regions/countries by these key players in order to strengthen their market position in the future. Rising demand for advance technology and increasing focus on quality, has encouraged manufacturers to design innovative actuators and valves with high efficiency to continue the profitability of the market. VK Holding A/S, Bürkert Fluid Control Systems, Emerson Electric Co., Flowserve Corporation, Honeywell International Inc., KITZ Corporation, Rotork Plc, Schlumberger Limited, Tyco International Ltd., Watts Water Technologies, Inc.., , are the key players which have been profiled in this study. Details such as financials, business strategies, SWOT analysis, recent developments, and other such strategic information pertaining to these players has been duly provided as part of company profiling.